Danish pianist; born at Grenaae, Jutland, May 31, 1841. His first instructors in piano were his mother and Anton Rée. In 1859 he went to Berlin, where he studied under Hans von Bülow. 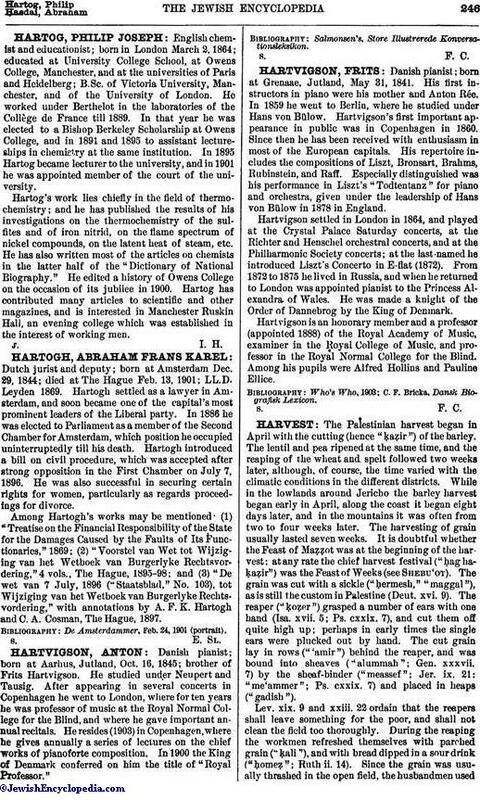 Hartvigson's first important appearance in public was in Copenhagen in 1860. Since then he has been received with enthusiasm in most of the European capitals. His repertoire includes the compositions of Liszt, Bronsart, Brahms, Rubinstein, and Raff. Especially distinguished was his performance in Liszt's "Todtentanz" for piano and orchestra, given under the leadership of Hans von Bülow in 1878 in England. Hartvigson settled in London in 1864, and played at the Crystal Palace Saturday concerts, at the Richter and Henschel orchestral concerts, and at the Philharmonic Society concerts; at the last-named he introduced Liszt's Concerto in E-flat (1872). From 1872 to 1875 he lived in Russia, and when he returned to London was appointed pianist to the Princess Alexandra of Wales. He was made a knight of the Order of Dannebrog by the King of Denmark. Hartvigson is an honorary member and a professor (appointed 1888) of the Royal Academy of Music, examiner in the Royal College of Music, and professor in the Royal Normal College for the Blind. Among his pupils were Alfred Hollins and Pauline Ellice.